"Youth Mental Health First Aid" "Adult Mental Health First Aid"
One in five Americans has a mental illness and many are reluctant to seek help or might not know where to turn for care. The symptoms of mental illness can be difficult to detect — even when friends and family of someone who appears to be developing a mental illness can tell that something is amiss, they may not know how to intervene or direct the person to proper treatment – which means that all too often, those in need of mental health services do not get them until it is too late. As a society, we largely remain ignorant about the signs and symptoms of mental illnesses, and we ignore our role as responsible community members to help people experiencing these illnesses. Please CLICK HERE for our most recent flyer. Youth Mental Health First Aid USA is an 8 hour public education program which introduces participants to the unique risk factors and warning signs of mental health problems in adolescents, builds understanding of the importance of early intervention, and teaches individuals how to help an adolescent in crisis or experiencing a mental health challenge. Mental Health First Aid uses role-playing and simulations to demonstrate how to assess a mental health crisis; select interventions and provide initial help; and connect young people to professional, peer, social, and self-help care. Youth Mental Health First Aid is designed to teach parents, family members, caregivers, teachers, school staff, peers, neighbors, health and human services workers, and other caring citizens how to help an adolescent (age 12-18) who is experiencing a mental health or addictions challenge or is in crisis. Youth Mental Health First Aid is primarily designed for adults who regularly interact with young people. The course introduces common mental health challenges for youth, reviews typical adolescent development, and teaches the 5-step ALGEE action plan for how to help young people in both crisis and non-crisis situations. Topics covered include anxiety, depression, substance use, disorders in which psychosis may occur, disruptive behavior disorders (including AD/HD), and eating disorders. Just as CPR helps you assist an individual having a heart attack — even if you have no clinical training — Mental Health First Aid helps you assist someone experiencing a mental health related crisis. In the Mental Health First Aid course, you learn risk factors and warning signs for mental health and addiction concerns, strategies for how to help someone in both crisis and non-crisis situations, and where to turn for help. Before you can know how to help, you need to know when to help. We call this mental health literacy – or a basic understanding of what different mental illnesses and addictions are, how they can affect a person’s daily life, and what helps individuals experiencing these challenges get well. The Mental Health First Aid course provides a variety of local and national resources to connect individuals in need to care. Mental Health First Aid helps you to identify potential sources of support and to practice offering these supports to the person you are helping. The course is designed for adults who regularly interact with adolescents (teachers, school staff, coaches, youth group leaders, parents, etc. ), but is being tested for appropriateness within older adolescent groups (16 and older) so as to encourage youth peer to peer interaction. In January 2013, President Obama recommended training for teachers in Mental Health First Aid. Since 2008, the core Mental Health First Aid course has been successfully offered to more than 175,000 people across the USA, including hospital staff, employers and business leaders, faith communities, law enforcement, and the general public. Mental Health First Aid was created in 2001 by Betty Kitchener, a nurse specializing in health education and Anthony Jorm, a mental health literacy professor. Kitchener and Jorm run Mental Health First Aid Australia, a national non-profit health promotion charity focused on training and research. The United States is just one of the many countries that have adapted the program from Australia. 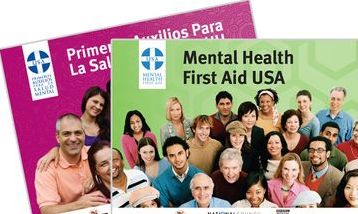 Mental Health First Aid USA is coordinated by the National Council for Behavioral Health, the Maryland Department of Health and Mental Hygiene, and the Missouri Department of Mental Health. 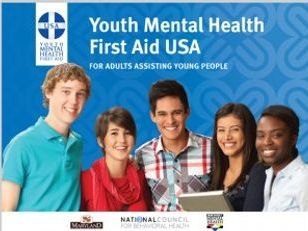 Mental Health First Aid USA worked with experts at the National Technical Assistance Center for Children’s Mental Health at the Georgetown University Center for Child and Human Development to develop the youth program..
All class and workshop dates will be posted for your convenience up-to 6 months in advance. Should you have any further questions or concerns, please do not hesitate to contact our office at: (800) 649-0925. "Our services are not intended to be a substitute for professional counseling"